In 1870, Nevada's first short-line railroad, the Virginia and Truckee Railroad (V&T), was completed between Carson City and Virginia City. Two years later, the track was extended to Reno to connect with the transcontinental Central Pacific Railroad. The V&T was the brain child of William Sharon, William Ralston and D.O. Mills of the Bank of California in San Francisco. They feared that Adolf Sutro's plan to drain the Comstock mines of water through an ingenious tunnel would adversely affect the bank-held monopoly of mills along the Carson River. William Sharon petitioned the Nevada legislature and received funds to build the railroad. This calculated move stalled the tunnel's completion for many years. The line served to haul ore from Virginia City to the mills in Carson City, lumber from the Sierra Nevada, and passengers traveling between Virginia City, Carson City, Reno and Minden (south of Carson City). The V&T operated from 1869 until 1950. Competition with cars and trucks in the 1920s and 1930s brought the V&T near bankruptcy, forcing the business to sell equipment and trains to collectors and Hollywood movie studios for Western movies, with the last run from Reno to Minden on May 31, 1950. About 50 pieces of the railroad remain today, more than half of which are housed at the Nevada State Railroad Museum, including two locomotives listed in the National Register of Historic Places, the Dayton and Inyo. Both locomotives saw intermittent service between the 1870s and 1930s. No. 18, the Dayton, was built in 1873, and is the sole survivor of the 62 locomotives built at the Central Pacific Railroad shops in Sacramento, California. The Dayton was used for passenger and snow service. Locomotive No. 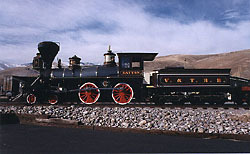 22, the Inyo, was built in 1875 by Baldwin Locomotives and used for passenger and freight service. Both the Dayton and Inyo were sold to Paramount Pictures Corp. in 1937. In 1939, the Dayton was used for a publicity run to New York promoting a Cecil B. DeMille film. 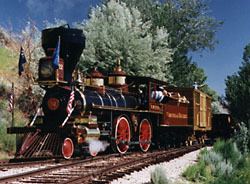 Both locomotives were part of the National Park Service's celebration of the centennial of the transcontinental railroad in 1969, and displayed at the Golden Spike National Historic Site in Promontory Point, Utah, before they were brought to the museum. Other railroad cars of interest at the museum include Locomotive No. 27 (unnamed), the last one purchased by V&T in 1913 and retired in 1948; the completely restored Caboose-coach No. 9; the V&T Express Mail No. 21, originally built in the railroad's own shops in 1906, and later used by Paramount Pictures in their movies through the 1970s; Express Mail No. 21, awaiting restoration; and Locomotive No. 25 (also unnamed), converted to an oil-burning boiler in 1907, that served as a back-up to the popular "Reno" No. 11. Locomotive No. 25 runs during special "steam-up" events throughout the year at the museum. Other V&T railroad cars and locomotives are on display at the California State Railroad Museum, the Railroad Museum of Pennsylvania and Old Tucson Studios.